For quite some time, Doosan has been buying used equipment, refurbishing it and selling via website listings and authorized Doosan and independent distributor locations around the world. Today, the Doosan Factory Certified Remanufacturing Program gives new life to aging machinery otherwise likely to be destined for permanent residence in an equipment graveyard. Doosan has one of the many certified remanufacturing programs on the market where a contractor can buy a rejuvenated piece of used equipment that’s been approved for a new life by the manufacturer itself. Take an air compressor for example, a Doosan specialty. 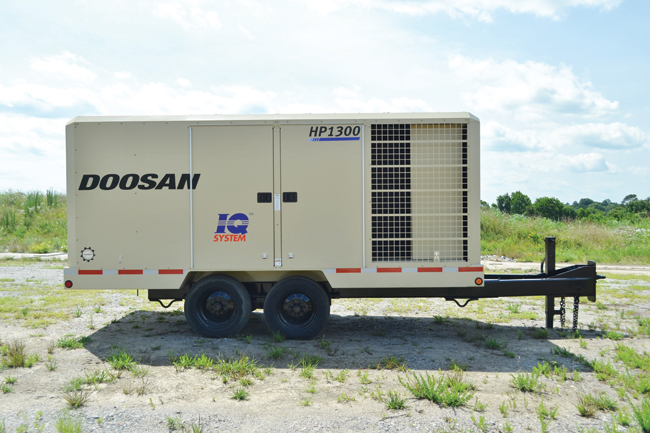 Under the factory certified remanufacturing process, Doosan Portable Power takes older, large air compressors — compressors of 675 cfm or larger, and previously manufactured by Ingersoll Rand or Doosan Portable Power — and returns them to showroom condition. Such air compressors receive a thorough, 117-point inspection upon arrival at the company’s headquarters in Statesville, N.C., after which, every unit is disassembled, all the way down to the frame. Each air compressor receives a remanufactured airend, as well as a remanufactured engine of the same tier classification as originally equipped. Then, parts from the original air compressor receive a top-to-bottom, inside-out cleaning. Those that meet the manufacturer’s stringent quality standards are reused wherever possible to minimize waste. New fluids are added, all filters replaced and the exterior sheet metal and frame receives a total makeover, including a paint stripping and recoating — all with strict adherence to the Doosan Portable Power painting process. Good reman programs have quality warranties. For example, the Doosan air compressor warranty covers one year or 2,000 hours on the compressor package and two years or 4,000 hours for the airend. The remanufactured engine is covered under new engine warranty provisions as prescribed by the applicable manufacturer. Extended warranty packages specific to the airend are also available. Securing equipment for remanufacturing eligibility often originates with authorized dealers. At Doosan, all larger models — 675 cfm and above, regardless of age — are accepted. Customers can usually present older model air compressors for remanufacturing and help contribute to efforts to reduce waste while lessening impacts on the environment. To become involved, customers should work directly through their authorized dealer. All pricing and shipping details will be handled directly with customers by the dealer. Although the remanufacturing program focuses on recycling current dealer and customer fleets, there may be a limited number of remanufactured units available for sale. At the Doosan Remarketing website, all available air compressor listings available for purchase by a qualified retail outlet or customer are posted at www.useddoosan.com. “The factory certified remanufacturing program is a great opportunity for our dealers to provide their customers with an alternative to buying new,” James says. “Since the remanufactured compressors are technically rebuilt from the frame up, and all remanufactured models carry a market leading warranty, there is little customer or dealer risk involved. According to James, access to factory-trained technicians that use genuine brand parts for rebuilding air compressors to OEM standards also provides peace of mind, security and reliability for purchasers of remanufactured air compressors. Upon learning about the factory certified remanufacturing program, Andy Tewell, owner of Central Texas Equipment based in Round Rock, Texas, was eager to learn more. “I have a longtime loyal customer involved in pipeline work who was searching for a good used air compressor,” Tewell says. “I’d heard about the remanufacturing program and thought this would be a great way to provide him with an affordable, reliable compressor without having to buy something new. According to Tewell, taking possession of the remanufactured air compressor more than a month ago, the customer is very happy — so much so, that Tewell is on the lookout for future opportunities to buy remanufactured air compressors. Randy Happel is a feature writer for Two Rivers Marketing, based in Des Moines, Iowa.